Cool prototyping can also provide some kinds of non-plastic molds, such as die-casting mold, stamping die etc. 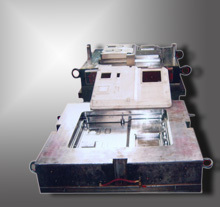 Die-casting mold is used to die casting process. Most die castings are made from non-ferrous metals, specifically zinc, copper, aluminium, magnesium, lead, and tin based alloys, although ferrous metal die castings are possible. We have strong backup factories overseas, so we can meet all of your requirements on molds product.